Simply put, we all have in common a strong tendency to want to avoid pain and pursue pleasure. This tendency is natural, yet it gets us humans into a lot of trouble. It is truly the root cause of addictions. Now, we could be talking about physical pain, or it could be emotional. Either one. And don’t underestimate the effects of a milder version of pain, like discomfort. Even something as seemingly minor or undramatic as slight anxiety or boredom is a state that we, consciously or unconsciously, try to avoid. Once upon a time, you learned that picking either relieved some pain or discomfort, or else gave you some pleasure or relief, or maybe both. So you did it again. And again. Before you knew it,it became a habit so well learned and strongly ingrained in your unconscious mind that when you tried to stop you found yourself unable. 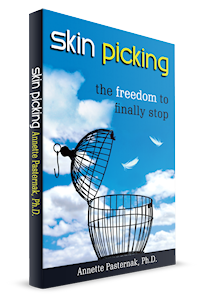 You also may have some genetic and biological tendencies towards doing this skin picking behavior to excess. Some people ARE predisposed to do the behavior repetitively based on their biological makeup. Whether they actually develop a skin picking problem or not is influenced by the changeable environment outside AND inside their bodies. It could be the presence of external stress that triggers it, or of a chance occurrence like someone teaching you how to pop a pimple. Or an early occasion when there was objectively a lot to pick at, like when you had chicken pox or a peeling sunburn as a child. 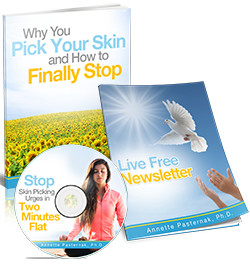 Or it could be the environment inside the body that can cause a genetic tendency towards skin picking to manifest. Some examples: the food you eat, whether you have healthy ways to balance your body in terms of exercise and rest, the thoughts you have (do you mentally pick on yourself? ), hormones, and even certain medications (for example, for ADHD). So that, in a nutshell, is why you started. Next, here are 7 reasons why you haven’t been able to stop.